The bicentennial celebratory release of Lagavulin 25 year pays homage to the distillery managers that helped shape its history and its whisky. That being the case, I thought I’d reach out to current Lagavulin Distillery Manager Georgie Crawford via email with a few questions. Georgie, thanks so much for taking the time to answer a few questions. 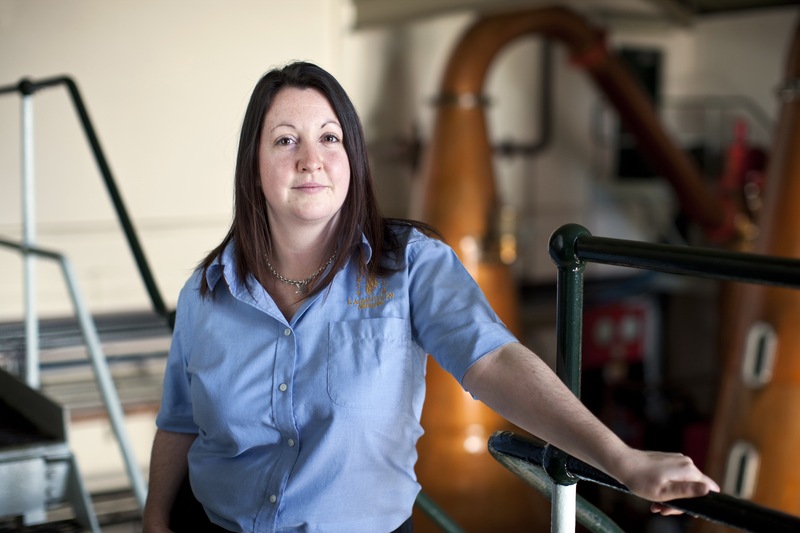 To start off, tell me a bit about how you got started in the business, and how your journey led to your current job as Distillery Manager of the Lagavulin distillery. I grew up firmly within the drinks and service industry and that’s really where my journey started. My parents had a pub here on Islay when I was growing up and we used to earn our pocket money by doing the bottling up, working in the kitchen and helping around the place. When I left full time education I ended up in Edinburgh where I started managing bars and restaurants. In 2002 I started a job at the Scotch Malt Whisky Society and was bitten by the whisky bug, I went on to manage a whisky shop in Speyside and then joined Diageo at Talisker Distillery on Skye in 2007. I have now been back at home on Islay and at Lagavulin since 2010. Coming to Lagavulin has been like being reconnected with a big extended family you didn’t realise you had. Everyone looks out for each other and is genuinely interested and passionate about the product we make here, which I love. The distillery is currently celebrating its 200th anniversary of (legally) distilling whisky. The celebratory bottlings include an 8-year and a 25-year. The former pays homage to the whisky Alfred Barnard drank back in the late 1800s. The 25-yr is a tribute to the Lagavulin distillery managers over the years. Expand on that, and tell me what it means to you. This Lagavulin 25 Year Old release is a special recognition of the contribution the Lagavulin distillery managers have made in crafting Lagavulin across the years. Lagavulin is treasured around the world as one of the most special Single Malt Scotch Whiskies and this is the first 25 Year Old release to be matured exclusively in sherry casks. 200 years ago, John Johnston & Archibald Campbell oversaw the first new make spirit distilled. Since that day the distillery managers have carried on the Lagavulin legacy alongside a hard working team of characters. From the peat cutters to operators, engineers and warehousemen and many others involved, this group of passionate people have helped craft Lagavulin into the world class spirit that it is. I am very proud to stand amongst them. Describe the new 25 year old whisky. Maturation, number of bottles, etc. Was putting together just the right blend of casks and ages difficult? The 25 Year Old is aged in 100% sherry casks and is Natural Cask Strength. We have produced 8,000 bottles and its amongst the oldest whiskies released by Lagavulin. We took samples from a large number of casks to ensure that the few selected for marrying for this bottling showed off Lagavulin at its best at this age. It’s a great liquid we are very proud of. Are there any special events happening at the distillery for the 200th anniversary? There have been a wide variety of events at the distillery this year as well as further afield. We understood that not everyone was going to be able to join us at the distillery so we created 360 videos which are available to view on Malts.com that not only show you around our production areas but also the great views from the distillery into the beautiful surrounding landscape. For those who have already and might still be able to visit before the end of the bi-centenary year we have created a special sensory tasting which dives deep into the complex nature, flavours and aromas of Lagavulin. You live and breathe Lagavulin. Which expression is your personal favorite? If I am out in open spaces I love an invigorating 12 Year Old from a hip flask. If I am at home in front of my peat fire on a wet and windy night, I love nothing more than the warmth of the Distillers Edition, on the other hand if I am looking to introduce people to Lagavulin who have never tried it before then Lagavulin 16 Year Old is the best option. Can you give us any hints as to what we might expect from Lagavulin in the coming months? We have the launch of the 25 Year Old happening which is keeping us very busy in the visitor center. There is one more exciting piece of news about a legacy which will have impact well beyond this year, watch this space! Thanks so much to Georgie, Lia, and all who helped make this interview possible.